The painting is the last da Vinci left in private hands. 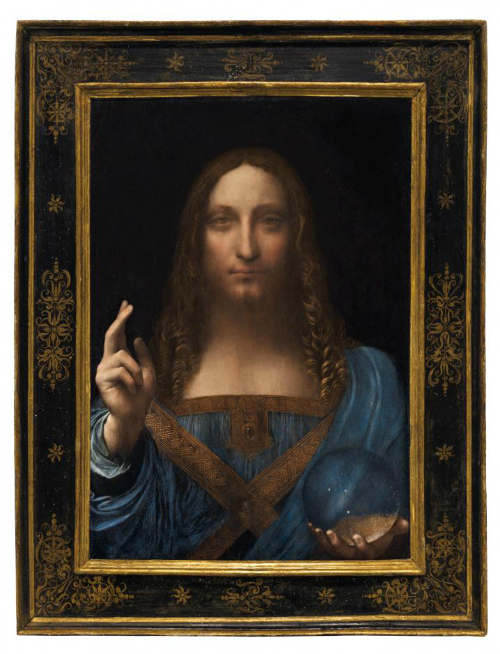 Leonardo da Vinci's portrait of Christ "Salvator Mundi" sold for a record-smashing $450.3 million on Wednesday at Christie's in New York, more than double the old mark for any work of art at auction. "Salvator Mundi," an ethereal portrait of Jesus Christ which dates to about 1500, the last privately owned Leonardo da Vinci painting, is on display for the media at Christie's auction in New York, U.S., October, 2017. Courtesy of Christie’s New York/Handout via Reuters. The painting, only recently rediscovered and the last da Vinci left in private hands, fetched more than four times over the Christie's pre-sale estimate of about $100 million. It was more than twice the old auction record set by Picasso's "Les Femmes D'Alger," which sold for $179.4 million in May 2015. "Salvator Mundi" was purchased by an unidentified buyer bidding via telephone after a protracted bidding war that stretched to nearly 20 minutes at the New York auction house.